Water for domestic use | Infonet Biovision Home. Short description: General notes on water quality and treatment for drinking water after harvesting it from different sources such as rain water, surface water, and ground water. Described methods: Sedimentation, filtration, cooking, solar water disinfection, chemical disinfection, other purification methods (e.g. using Moringa oleifera). The quality of water is crucial to ensure the health of the people consuming it. There are three main criteria for water quality: firstly its natural co-compounds like calcium or magnesium, secondly pollution by chemicals like pesticides or fuels, and thirdly biological contamination by bacteria or other microorganisms. Biologically contaminated water can be treated and made palatable. Treatment of chemically polluted water is extremely complex and costly, so the best way is to protect the water sources from chemical pollution. Chemically pure water is a molecule that consist of two hydrogen atoms bonded to a single oxygen atom. 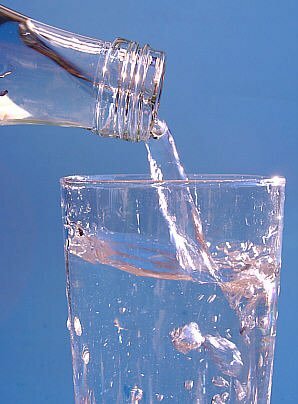 Water is a tasteless, odorless liquid at ambient temperature and pressure, and appears colourless in small quantities, although it has its own intrinsic very light blue hue. Nevertheless, according to experience, water has often a quiet distinct taste. This taste is caused by numerous co-compounds that are solute in the water. The most common compounds of groundwater are calcium and magnesium that are solutes from the rock the water flow through. The concentration of these elements depends on the composition of the respective rock-underground. Calcium and magnesium give the water a special taste and are at the same time essential elements of the human diet. Rainwater lacks of those elements, which has to be considered when consuming only rainwater. Spring or well water can also contain elements that are toxic when consumed, such as arsene. There are various methods to tread the water. There are various sources of chemical pollution such as for example spilled fuels, pesticides used on crop fields or in house gardens, or heavy metals leached from rainwater harvesting installations. Generally, chemical pollution of water cannot be undone and the water can be rendered unpalatable by chemical pollution. Hence, it is very important to protect water sources from chemical pollution. For more details see protecting water sources in the document water harvesting. Besides chemical pollution by fuels, pesticides, etc., water can also be polluted by microorganisms. Microorganisms can cause , depending on the type and concentration , light to very heavy illness. Diseases such as Amoebiasis, Schistosomiasis, Cholera and many others are waterborne. Generally, biologically contaminated water can be treated by different methods. 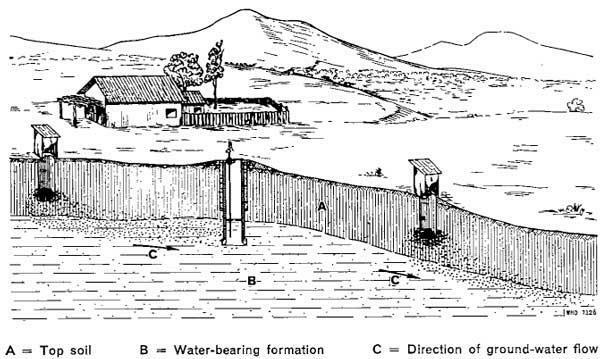 Latrines positioned upstream and downstream of a well (Wagner and Lanoix 1958). Water infiltrating from the surface, e.g. after a heavy rain, can carry microorganisms from a latrine pit through the soil to the ground water. Thus, when finding a suitable place for a latrine, the ground water flow has to be taken into account. Latrines should always be built downstream to wells or sources. Also other possible sources of contamination should have a minimum distance from wells, sources or surface water. If the watershed of a groundwater flow is known, it should be specially protected, e.g. hazardous transports should not be allowed to pass through the area. A watershed is defined as any surface area from which all rainwater is drained into the same water catchment. This does not only include surface water streams but also groundwater streams. 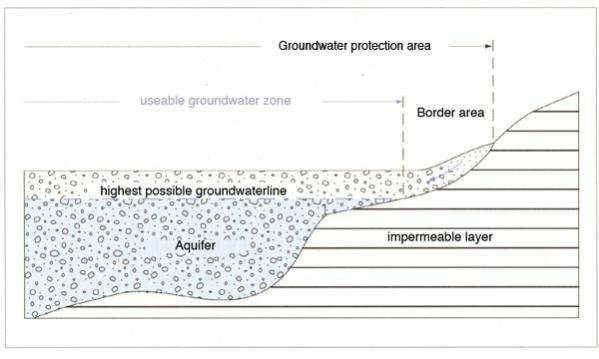 Ground water is usually built by different layers as shown in the figure below. Wells should be constructed according to certain rules: the well should be protected from run-off or spilled water by a concrete apron with high walls. The concrete for the apron should be of good quality and should not have any cracks that might allow waste water from the surface to return to the source. In areas where springs occur, the spring and its surroundings need to be protected from contamination. The area directly around the spring should be fenced to exclude animals and humans. Also the upstream area should be fenced to avoid contamination of the source. The spring chamber should be lined and covered and pipes should be layered to access the water. The access point should be at a safe distance downstream from the spring site. Water can be lost in different ways: it can run-off, evaporate or being contaminated and not usable any more. How to prevent contamination of the water was discussed above. Evaporation and evapotranspiration (or simply transpiration) gets stronger, the warmer the climate is. Evaporation means the loss of water from the soil surface, transpiration means the loss of water through the leafs of plants. Measures to counter this loss of water include firstly the increase of vegetation, preferably multi storage vegetation, to create shadow and, thus, reducing direct sun; and secondly by reducing the wind speed with hedges and shelter belts. Leaving the soil undisturbed by practicing no, or only a minimal, tillage also reduces evaporation. An increased soil cover also increases the infiltration of the water into the soil and, thus, minimizes water run-off. During the rainy season, the surface run-off can be spread by different measures to improve the infiltration of the water. One possible method is to build terraces by constructing barriers. Because of the reduced slope and the spreading of the water, it has more time and a bigger surface area to infiltrate and the terraces at the same time protect the soil from erosion and reduce the damage caused by heavy rain storms. Barriers can also be built in a way that run-off is diverted to cultivated fields or single trees, providing them with an extra amount of water. Generally, it can be said that protecting a water source from contamination is easier than treat contaminated water to get safe drinking water. Contaminated water can be treated with physical or chemical methods. Physical methods include sedimentation, filtration, boiling, and solar water disinfection. Chemical methods include disinfection with chlorine, iodine, silver, or potassium-permanganate. Most of the time, several of those methods are combined to get safe drinking water. The first step is normally to clean the water optically, i.e. remove sediment or filter the solid particles. Then, chemical or biological contamination can be removed by boiling, disinfection or chemical treatment. Alternative purification methods include for example plants like a tree called Moringa which supports the coagulation and subsequent sedimentation of solid particles in turbid water. For many chemical or physical desinfection methods, turbid water is treated less effectively. The first step of water treatment is often sedimentation, especially in the cases of turbid water. Generally, the methods used are very simple. The goal is to let the silt sink down and decant the clear water. Since this takes some time, the sedimentation process takes up to two days. Within this time, even pathogen bacteria can be reduced by 97%. Sedimentation can be done in simple, covered containers. 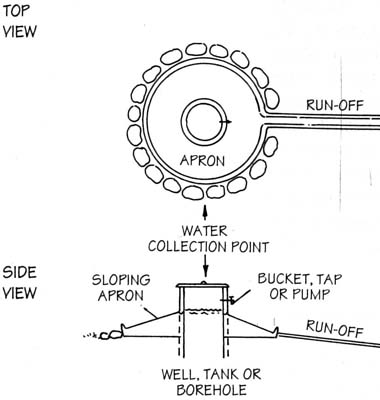 Also simple flow-through sedimentation tanks can be built. Although the water is normally fairly clear after the sedimentation process, it is not treated enough for drinking. At least one further step, the filtration, is required. Filtration is the next step after sedimentation. It is an easy and cheap way to treat contaminated water. Depending on the types of filter, up to 100% of bacteria and most of the viruses as well as all bigger organisms (cysts, worm eggs, etc.) are being removed. There are multiple types of filters: sand filters, ceramic filters, and cloth filters. Two types of sand filters can be compared: pressure filters and gravity filters. Pressure filters are often used in industrial water treatment. Here, only gravity filters, which are much cheaper in set-up and maintenance, are considered. The principle of a sand filter is the following: driven by gravity, water flows through a layer of previously washed sand and gets cleaned from solid particles, dissolved compounds as well as to a certain part microorganisms. In slow sand filtration, a biological layer is formed on top of the sand, which is additionally active in deactivation and removal of pathogens from the water. In rapid sand filtration this additional biological filter is missing and, hence, the water is often chemically pretreated before filtration. Rapid sand filters are suitable for large urban centers where land scarcity is an issue, whereas slow sand filters tend to be more suitable for areas where land is more available, since they need a much larger surface area to treat the same amount of water. Slow sand filtration is simpler to operate than rapid filtration, as frequent backwashing is not required and pumps are not always necessary. The advantage of slow sand filters is that they can be built locally with local materials. When properly maintained, they remove 90-99% of bacteria and also other pathogens. But they require the proper maintenance such as regular cleaning by scratching away the biological layer on top of the sand. During the first 1-2 weeks of use, the water is not cleaned, because the biological layer has to grow first. Also after cleaning, the filter needs some time to recover. If the filter has to be cleaned very often, the water is too silty and should be allowed to stand in a large tank or prefiltered beforehand. For prefiltration, an upward flow filter is useful. In an upward flow filter, the bed of coarse (3 to 4mm) sand is supported on a plate pierced all over with 2 mm holes 50 mm apart. The advantage of the upward flow filter is that it is easy to clean the sand bed once a day by shutting the flow off and pulling the drain plug. Ceramic filters have a pore diameter of about 200 nm, which means that it can filter bacteria (usually bigger than 300 nm) and reduce but not totally filter viruses (which can be as small as 20 nm). One simple form of ceramic filters is clay pots. The ceramic filters often have a coating of colloidal silver, which acts as bactericide and enhances the purification effect. Furthermore, the silver hinders bacteria from growing on the ceramic filter surface. Ceramic filters remove 90-99% of bacteria as well as other pathogens. But compared with slow sand filters, their through flow is much smaller, so they are suitable only for household use. Ceramic filters need regular cleaning and proper handling, so they don't break. Cloth filters, mostly made of cotton also filter particles with the size of their pores. Since microorganisms are associated with plankton or other bigger particles, they can also be removed by filters with bigger pore sizes than the size organisms themselves. 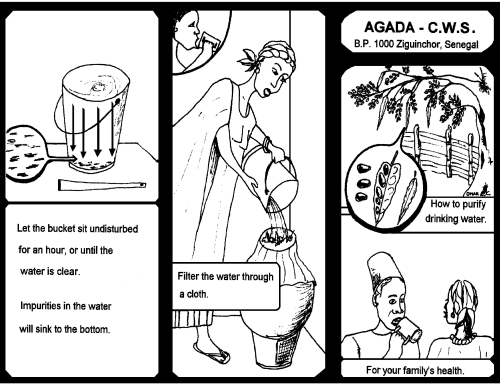 Cloth filters showed to be effective against cholera or the Guinea worm. Cloth filters should only be used as a last means if no other way of water purification is available since its effectiveness is lowest compared with the other described filter methods. 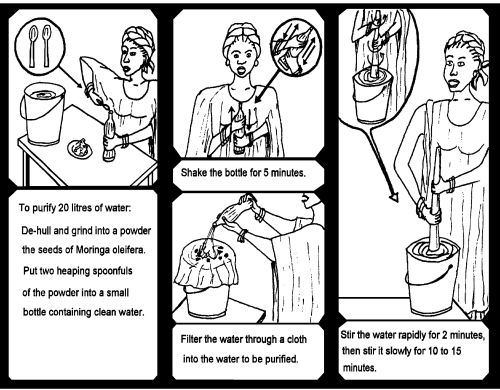 Water purification using Moringa sp. Moringa is a tropical tree with multiple uses, which is resistant to drought. Among the 13 species known, Moringa oleifera is particularly easy to reproduce and its growth is very fast. The numerous economic uses of M. oleifera together with its easy propagation have raised growing international interest for this tree which originated from India and which is found in most tropical countries (Africa, Asia and America). M. stenopetala and other species from Eastern Africa and Madagascar also have potential even though they have been less exploited so far. All of the parts of M. oleifera can be used in a variety of ways. Moringa is full of nutrients and vitamins and is good in human food as well as in animal food. Moringa helps to clean dirty water and is a useful source of medicines. It provides lots of leafy material that can be utilized in alley cropping systems. There are many other uses as for example as fertiliser, living fence, natural pesticide, domestic cleaning agent, and fuel wood. For more information on the different uses of moringa click here. 1. Moringa can be used as a locally-produced substitute for imported flocculent, thus reducing expenditure of foreign currency reserves by third world countries. 2. Moringa flocculent, unlike aluminum sulphate, is completely biodegradable. This aspect may be particularly interesting to developed countries. The seed powder joins with the solids in the water and sinks to the bottom. This treatment also removes 90-99% of bacteria contained in water. Using Moringa to purify water replaces chemicals such as aluminum sulphate, which are dangerous to people and the environment, and are expensive. Water from varying sources will need different amounts of powder because the impurities present might not be the same. Experiments with a jar will help in working out the correct amount needed. Honey and sugar cane juice can also be cleared of impurities using the powder. Moringa stenopetala seeds have better water purifying properties than Moringa oleifera. Step 1 Remove the wings and brown seed coat and discard any seed kernels that have dark spots or any other signs of damage. Step 2 Ground the kernels to a fine powder. Step 3 Add 2 grams (2 small spoons) of powder to one cup of clean water, pour into a bottle and shake for 5 minutes. Step 4 Filter the solution through a clean cloth into the bucket of dirty water that is to be treated. Step 5 Stir the water quickly for 2 minutes and slowly for 10 to 15 minutes (do not use metal implements). Step 6 Leave the bucket undisturbed for one hour or until the water becomes clear and the impurities have sunk to the bottom. Step 8 Boil the water before drinking. Both the seeds and the seed powder can be stored but the solution made in stage 3 should be freshly made every time water is to be purified. The crushed seed powder, when mixed with water, yields water-soluble proteins that possess a net positive charge and act as a cationic polyelectrolyte that has proved efficient as a substitute to aluminum sulphate and other flocculent. These proteins attach themselves to, and bind between, suspended particles forming larger, agglomerated solids. These flocculated solids then can be led to settle and filtered. Dosing solutions are generally prepared as 1-3% solutions and are filtered prior to application to the untreated water. At low turbidity, as may be experienced during the dry season, the seeds are less effective although their performance is very much dependent on the raw water to be treated. For low turbidity, the contact flocculation-filtration process has to be applied. Despite the usefulness of M. oleifera and other similar organic coagulants for treatment of turbid water, there has been little effort to characterize the active agents in these seed extracts or evaluate the efficacy as coagulants in reducing microbes from waters having different turbidities. The findings so far suggest that such seed extracts may function as a particulate, colloidal and soluble polymeric coagulant (see above) as well as a coagulant aid. The presence of other constituents in these seed extracts is uncertain, and there is concern that they may contain toxicants, because the portions of the plant also are used for medicinal purposes. Boiling is the simplest method to remove all pathogens from water. If the water is heavily contaminated, a boiling duration of 3 minutes is recommended. The water should not be poured in another vessel since it could be re-contaminated. The disadvantages of boiling are the bland taste of the water after cooking and the large amount of energy needed. For one litre of water one kilogram of wood is needed for cooking. In areas with scarce wood availability, it is often hard for the women to collect enough fire wood even for cooking. In forest areas, water treatment by boiling increases the pressure on the forest, which can lead to deforestation and subsequent problems like erosion, water scarceness, and loss of biodiversity. Microorganisms which occur in some water resources used as drinking water can cause water borne diseases such as diarrhoea. 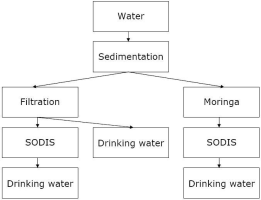 SODIS is seen by the World Health Organization (WHO) as one of the technically simplest and most practical and economical ways to improve the quality of such drinking water. Water that is contaminated with microorganisms is filled into clean, transparent plastic bottles and exposed to full sunlight for six hours. The solar radiation and temperature destroy the micro-organisms in the water. This method is ideal to produce small quantities of safe drinking water for the household level. The WHO recognizes that heating water, other liquids and other foods using solar radiation is a more accessible, economical and technologically feasible option than heating with fuel. Plastic bottles made from PET are good containers for SODIS. PET soft drink bottles are often easily available. The containers used for SODIS should not exceed a water depth of 10 cm, i.e. PET bottles of 1-2 litre volume. To distinguish a PET- from a PVC-bottle, try to inflame it. PVC is difficult to flame. The material does not burn outside the flame. The smell of the smoke is pungent. PET burns easily when held into a flame. The fire goes out slowly or not at all outside the flame. The smell of the smoke is sweet. You should not use PVC bottles for SODIS. Solar Water Disinfection does not change the chemical water quality. Do not use chemically polluted water. SODIS requires relatively clear water. To test the water turbidity, there is a very simple test: Fill the SODIS bottle with the water and place the bottle on top of a paper with the SODIS-Logo (the letters should have a size of about 1.5 cm). Open the lid of the bottle and watch through the bottle to the bottom of the bottle. If you still can read the letters of the SODIS-Logo on the paper, you can use the water for SODIS. If you cannot read the letters, the water is too turbid for SODIS and needs to be filtered or the solids have to be decanted first. Let the full bottle stand until the suspended particles have sunken to the ground. Filter the water through a clean cotton cloth or filter and fill it into a new bottle without the sunken particles. Wash the bottle well the first time you use it. Fill the bottle to 3/4 and close it. Shake it a few times. Then fill it completely with water. This procedure is particularly important if you treat standing water (as for example stored rainwater). Oxygen in combination with sunlight helps destroying the micro-organisms in the water. 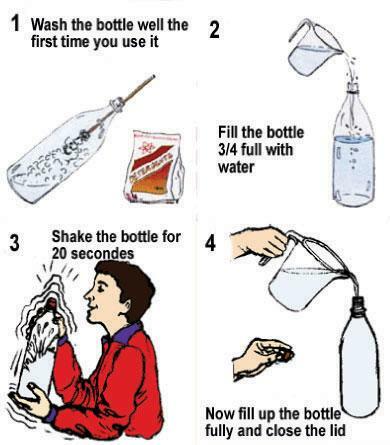 After shaking, the bottle should be filled completely. The bottle needs to be exposed to the sun for 6 hours if the sky is bright or up to half clouded. If the sky is completely cloudy, then the bottle needs to be exposed to the sun for 2 consecutive days. During days of continuous rainfall, SODIS does not perform satisfactorily. Rainwater harvesting is recommended during these days. After this time, the water is ready for consumption. 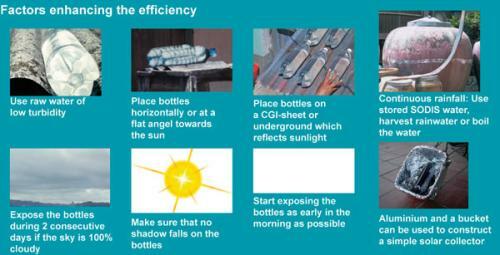 Place the bottles on a surface: It needs to be fully exposed to the sun, and never shaded during exposure. Protect the bottles from wind cooling - do not place on open wood racks. Place the bottles on surfaces reflecting the sunlight such as corrugated iron sheets, which can enhance SODIS efficiency. Never place the SODIS bottles on inflammable materials, such as cloth or straw. Since the bottles can act as a magnifying lens, they can set fire to inflammable materials. 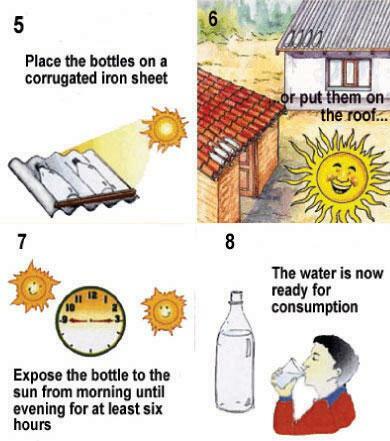 Place the plastic bottles on a corrugated iron sheet, (this will increase the water temperature by about 5degC.) Use raw water with low turbidity, expose the bottle for two consecutive days on cloudy days, and replace scratched and dull bottles after about one year of regular daily SODIS application. For the best results, plastic bottles of 1-2 litres volumes are used (better surface/volume ratio). Laying the bottles horizontally increases the area for sunlight exposure and reduces water depth. Like this, micro-organisms are more easily destroyed. Mistake Nr. 3: After SODIS treatment, the clean water is filled into contaminated containers and the water is re-contaminated. Consume the treated water directly from the bottle using a clean glass or a cup. Green or brown bottles do not sufficiently transmit the sunlight. Therefore, use clear transparent bottles only. SODIS is used to inactivate the pathogenic microorganisms, predominantly those causing diarrhoea. Most pathogens cannot grow outside the human body apart from a few exceptions such as salmonella, which however requires favourable environmental conditions (e.g. appropriate supply of nutrients). Sunlight is treating the contaminated water through two synergetic mechanisms: Radiation in the spectrum of UV-A (wavelength 320-400 nm) and increased water temperature. This synergy of UV-A and temperature occurs, if the water temperature rises above 45degC. If the water temperature rises above 50degC, the disinfection process is three times faster. However, through UV-A radiation, SODIS also works in cool climatic areas, such as the Andeas or the Himalaya region, where the water temperature does not exceed 45degC. The laboratory experiments showed an efficient reduction of the faecal coliforms through SODIS also with initial concentration of 10'000/100 ml up to more than one million/100ml. This is much more than normally encountered in common river and ponds (a few thousand/100 ml or less). However it has to be considered, that the conditions during the experiments are different from practical situations, where the process might not be applied in a strictly controlled way, materials are not optimal and handling of the treated water often is inadequate. Protozoa: Giardia spp., Cryptosporidium spp. With the aeration, oxygen is dissolved in the water. SODIS is more efficient in water containing high levels of oxygen: Sunlight produces highly reactive forms of oxygen (oxygen free radicals and hydrogen peroxides) in the water. These reactive molecules react with cell structures and kill the pathogens. Recent research however revealed that the bottles should be shaken only at the beginning of the SODIS process. Once the bottles are exposed to the sun, they should not be moved anymore, as continuous shaking of the bottles during the solar exposure will reduce the efficiency of the process. When water is boiled, the level of the oxygen dissolved in the water decreases. This changes the taste of boiled water, making it tasteless fresh and softer. SODIS on the other side improves the quality of drinking water without changing its taste. The bottles are closed during the exposition to the sun. Therefore, the level of oxygen dissolved in the water remains the same. The taste of the water keeps fresh. Lack of a residual disinfectant to protect water during handling and storage. However, stored in the bottle, the treated water is protected from recontamination. No regrowth has been observed so far, even if the treated water was stored for one week. Weaning food for children less than 18 months should be prepared with boiled water. Repeadedly concerns are expressed abut the possibility of specific compounds leaching from reused and new PET bottles into the water. Therefore, a team of researchers from the EMPA (Swiss Federal Laboratories for Materials Testing and Research) tested the diffusion of adipates and phtalates such as DEHA and DEHP from new and reused PET bottles. The levels of concentration found in the water of reused and new PET-bottles were very low, e.g. in the same magnitude as the concentrations of phtalate and adipate generally found in high quality tap water. Also the concentrations of formaldehyd and acetaldehyd were found to be below the thresholds for safe drinking water (click here for details). A group of researchers from the University of Heidelberg assessed the diffusion of Antimom from new PET-bottles that had been stored for several months in the supermarket. They found a concentration of 300 to 600 ng antimom per liter (click here for details). This concentration is far below the WHO threshold value for drinking water (20 ug/l). Chlorination is still a worldwide used method for the disinfection of water. When used with water filtration methods, chlorine is effective against virtually all microorganisms. Chlorine is easy to apply and small amounts of the chemical remain in the water as it travels in the distribution system or is stored in a tank or cistern. This level of effectiveness ensures that microorganisms cannot re-contaminate the water after treatment. Chlorination is useful for the treatment of a central water supply in a village but not for individual household use, since its application has to be done in a professional way. The application of chlorine can produce certain by-products that can lead to health problems. Chlorine can also be used as an emergency measure for the disinfection of a water storage that has been accidentally contaminated, e.g. after a storm or by a dead animal. Chemical Science. Toxic risk in bottled water - Available at www.rsc.org. Moringa news. Available at www.moringanews.org. Moringa oleifera. A multi-purpose tree. Produced by HDRA - The organic organisation. Available at www.gardenorganic.org.uk. Potters for Peace. Filters. Available at www.onlinehome.us. SODIS, solar water disinfection. Available at www.sodis.ch. WHO. Managing water in the home: accelerated health gains from improved water supply. Available at www.who.int.